All three presidential candidates proudly flaunted the school’s colors — either blue or red — and discussed their campaigns until hearing the final strike of the moderator’s gavel. 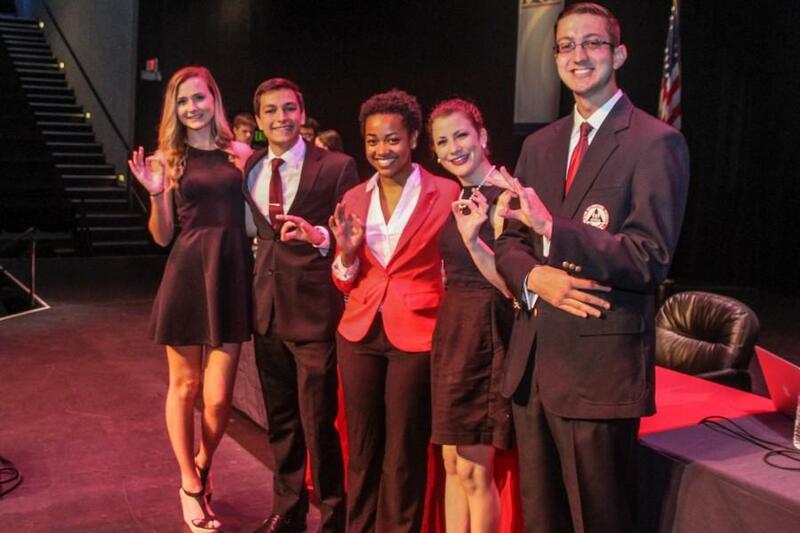 The Florida Atlantic presidential debate took place on Friday at 5 p.m., in the Carol and Barry Kaye Performing Arts Auditorium. The event started with moderator Chaz Holmes describing how the debate would go in chronological order: Introductions, questions, presidential questions, vice presidential questions, student questions and closing remarks. Senior political science major Milor Perdomo was in attendance to cheer on current student body President Edmunds. “It’s very important to be involved in the political process,” Perdomo said. Topics ranged from school pride to programs aimed at student wellbeing — like the mental health department — and increasing the diversity of Student Government. Cairo said he wanted to make this a school where students transfer to, and not from. He said that to make this a possibility, both he and Walters will advocate that the provost hones in on having the student advisers for each college play a major part in each and every student’s university experience here at FAU. Clark had a different outlook on what she would bring to the school if her ticket was elected; her campaign revolved around four pillars. They comprise her SASS campaign: Sustainability, Accountability, Safety and Spirit. She also mentioned the need for a stronger mental health department. “Did you know the Jupiter Campus doesn’t even have a psychologist on campus?” Clark asked. Although after further research, it has been verified that FAU’s Jupiter branch does in fact have three psychologists working on campus. Edmunds focused on what she did last year and what she can do as president this year through lobbying the state. “We want to make sure students can still afford to go to college, and that happens at the state level,” Edmunds said. Some of the candidates seemed to dodge the question with promises. Edmunds spent the most time on the subject of the board. Cairo’s answers addressed how students at different campuses have different needs. He said that an average FAU student in Davie is 25 and has a child. “Do they need keychains, do they need concerts? No, they need free coffee,” Cairo said. A hot button topic of the debate was when the vice presidents started addressing the red tape involved in getting greek housing on campus and disciplinary actions occurring in Greek organizations. The vice presidential questions caused an uproar between both Walters and Sims. Each candidate was asked how they would distribute the activity and service fee funding. Walters wants to put more funding into the Program Board and ensure that Student Media has enough money to properly work and cover the campus. Sims’ rebuttal focused on mental health — questioning Walters priorities. This was followed by a back and forth between the two on who was more aware of their job. “I think it would be a good idea to incorporate a full weekend of training for the senators so they are aware of the legislation being put forth,” Sims said. Walters asked him if he was aware that there’s already senator training. Sims said he was aware of the training, but that it was mostly powerpoint-based. One of the student questions was, “What would you do to prevent student bias against another organization?” Each candidate answered the question in their own way. One point Sims made was to focus on the big picture. After his response, each presidential candidate had the opportunity to present their closing statements. Cairo was the first to offer his response. Clark focused on establishing a diverse cabinet. Elections will be held on Feb. 23 and Feb. 24. Voting on the Boca Raton campus will be at the Student Union. Voting will be also be online at Owl Central. To view a live rundown of the debate, click here. News editor Patrick Martin contributed to this story. Nate Nkumbu and John Paul Tanner are contributing writers with the University Press. To contact Nkumbu regarding this or other stories, he can be reached at [email protected] or on Twitter. Tanner can be reached at [email protected].